Soy is one of the greatest causes of allergy suffered by children. Infants are usually exposed to soy, a product of soybeans through infant formulas containing the substance. Children usually outgrow this allergy by the time they reach three years old, only now research is finding that the allergy can continue into adulthood in some individuals. For the most part a soy allergy is just a bit uncomfortable. In rare occasions a soy allergic reaction can be serious or even life threatening. The symptoms of a soy allergy usually surface within minutes or up to an hour after ingesting soy. These symptoms include: tingling feeling in the mouth, skin rashes such as hives, or eczema or itching skin, swelling of throat, face, tongue and lips or swelling in other parts of the body. There could also be trouble breathing, wheezing, and a runny nose, abdominal pain, nausea or vomiting, diarrhea, dizziness, lightheadedness or fainting. Some times an anaphylaxis reaction can occur. This is a very serious allergic reaction that can be life threatening, though it is very rare. If this were the case, the symptoms would be: swollen throat, or a lump in the throat and other airway constriction making it difficult to breathe. The patient could experience rapid pulse, shock, and a severe drop in blood pressure, dizziness, lightheadedness or loss of consciousness. You would see a doctor if you start to experience the mild symptoms after eating. At this point you may not even know you have a soy allergy per se, but you can suspect that you have some kind of food allergy. However, if you do experience anaphylaxis symptoms don’t wait for a doctor’s appointment, get to an emergency center immediately for treatment. Besides the symptoms listed above for anaphylaxis, if you experience drooling with an inability to swallow, changes in the quality of your voice or full body redness and flushing on the body get help quickly. Basically, all allergies are a result of an immune system dysfunction, where the body interprets the food or other harmless substances as a foreign toxin and therefore it will send out immunoglobulin E (IgE) antibodies to neutralize the allergen. In this case it is soy. The second time it comes into contact with soy it will release histamines into the bloodstream. There are several chemicals that can be released in the body and cause allergic symptoms; histamine in particular is the one responsible for runny noses, itchy eyes, rashes, dry throat, hives, diarrhea, labored breathing and anaphylactic reactions. There are about 15 different soy proteins, which trigger allergic reactions though why they do has not yet been determined. Any one with a family history of allergies to soy, foods, hay fever, asthma, hives or eczema can be at risk for a soy allergy. Age is a factor. Soy allergies are most common in young children. The children’s immune system mature with age and they usually outgrow the allergy. Normally a soy allergy can be determined through a skin test and a blood test. The best way to treat a soy reaction is to avoid eating soy. However, if you have eaten soy then antihistamine medications are usually prescribed. 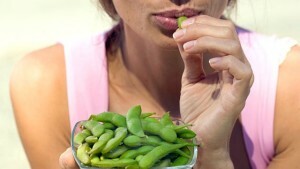 If you have a serious reaction to soy then usually injections of epinephrine also known as adrenaline will be required. The patient at home can do this prior to going to emergency for a second shot. It would be a prudent to breastfeed if you are a mother of a newborn and there is a history of soy or other allergies in the family. Read all food labels. 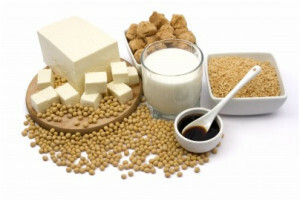 Soy can be found in a variety of foods such as tofu, miso natto, tempeh, soy sauce, soy flour, vegetable broth, lecithin, monosodium glutamate (MSG), vegetable oil, textured vegetable protein (TVP), Hydrolyzed vegetable protein (HVP), vitamin E, natural flavoring, vegetable gum, vegetable starch, and Asian flavoring.